An annotated video tutorial outlining the main points to be tackled when working to complete ‘Singularity’ to a high standard. 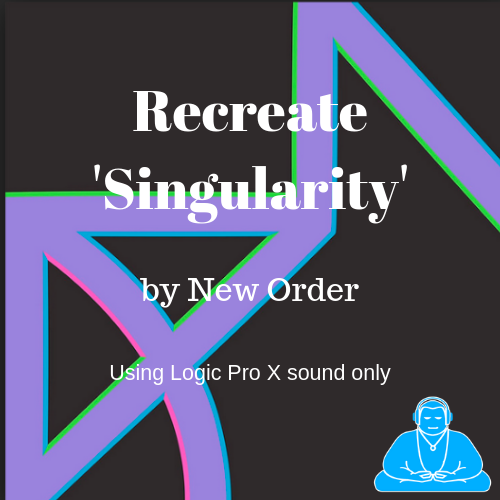 How to Recreate ‘Singularity’ by New Order Tutorial Pack. New Order are a Electronic based rock band that started out way back in 1980. They are known for mixing punk style guitars and electronic synths to their productions. They disbanded in 1993 but reformed in 2011. The song ‘singularity’ was featured on their comeback album ‘Music Complete’ that was released in 2015. It has been a well-received album earning them the NME’s best album of the year 2015. This arrangement has been meticulously analysed and recreated to show in detail how the track is put together and produced. By examining the arrangement, and looking how it commercially produced music is created it is possible to gain an insight into how to create a highly polished track of your own. Various production techniques will become apparent as you examine the arrangement, and these techniques can be transferred to your own music productions. Use the ideas covered in this tutorial to inspire you and try new and exciting ideas! It often seems that good music sounds simple, but this is deceptive. The more you listen, the more you hear, and this really is the key to good music production – Critical Listening. ‘The devil is in the detail’ is very true when it comes to music production, and by closely examining the various parts of the arrangement you will gain insight that will help you immeasurably in your quest for audio production perfection. The arrangement has been created by only using the stock sounds and processors available in Logic Pro. Although this does have some limitations, it illustrates the possibilities that are open to you with just the basic sequencer setup. It shows that professional level studio setups are not necessarily needed to create excellent results. It comes back to the same thing – Critical listening. Logic Pro has all the audio processors that you need in order to explore the huge array of production techniques available. It takes a long time and plenty of patience to really get the hang of all the different processes. By restricting yourself to just the stock effects and sounds, you are less liable to get overwhelmed and more likely to find creative solutions to production issues. Originally these tutorials were designed for use with a Post-16 Qualification (AS & A level), and as such are designed for use with the standard Logic Pro sequencer to make the tutorials compatible with school/college setups across the UK. There are plenty of free tutorials available on www.musictechguru.com that can also help you with your productions, including sampling, synthesis and mixing. A step by step guide to achieving a high standard version of the song ‘King’ by Years & Years. A step by step guide to achieving a high standard version of the song ‘Brick England’ by The Pet Shop Boys.